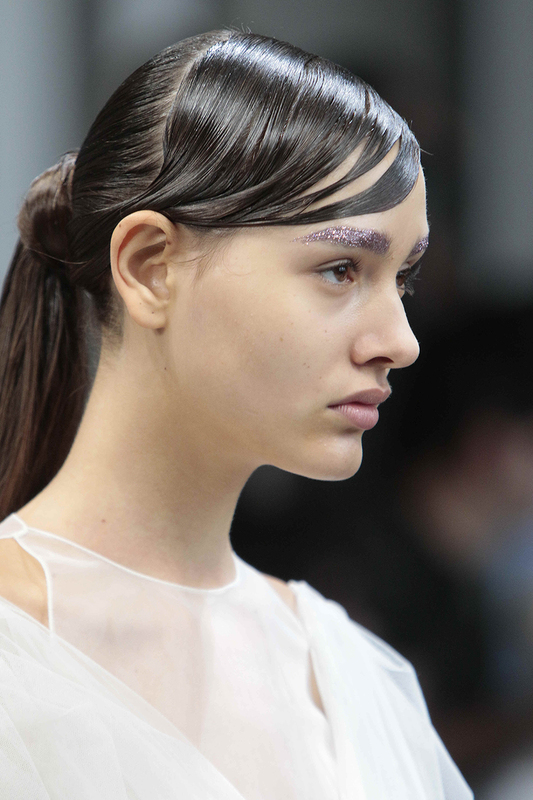 Runway hairstylist Jorge Luis styled eye-catching, creative and modern looks for the Son Jung Wan Spring/Summer 2019 Runway Collection. The key: using the new professional Tri-Plex Fusion technology StyleCraft hairdryer and a unique StyleCraft Shmedium compact flat iron to naturally boost gloss and shine, stop frizz and treat hair at the same time. Styles were flat, chic and sleek – light-looking without stiffness or weight – a unique hybrid of rounded and linear lines. Long, swirls of side-parted hair were brilliantly brought down and around the side of head and then lifted up to encircle the top of ponytails. Simple, modern, completely unique. “This is always one of my favorite shows, and for this season I loved the modern glamour paired with the inspiration of the exaggerated silhouettes of eras past,” said Luis. Create a deep left side part. 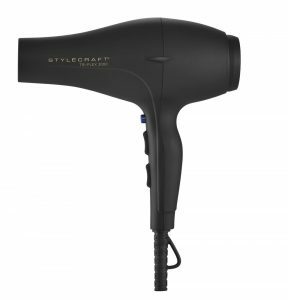 Blow dry with StyleCraft Tri-Plex 3000 Hairdryer using a large round brush. 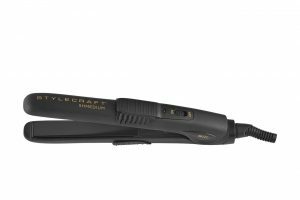 Flat iron hair in large vertical sections with StyleCraft Shmedium Travel Iron. Section hair across top of head for deep bangs. Comb a small amount of gel through hair – from crown to nape. Sweep bangs to the side, shape and round, separate slightly with tip of comb to make slits. Tie the ponytail. Then sweep side-parted hair down and around side of head and back up and around to the top of the pony. Twist and weave around elastic. Secure with hairpin. Straighten, smooth, and defrizz the ends of the ponytail with StyleCraft Shmedium Travel Iron to finish.